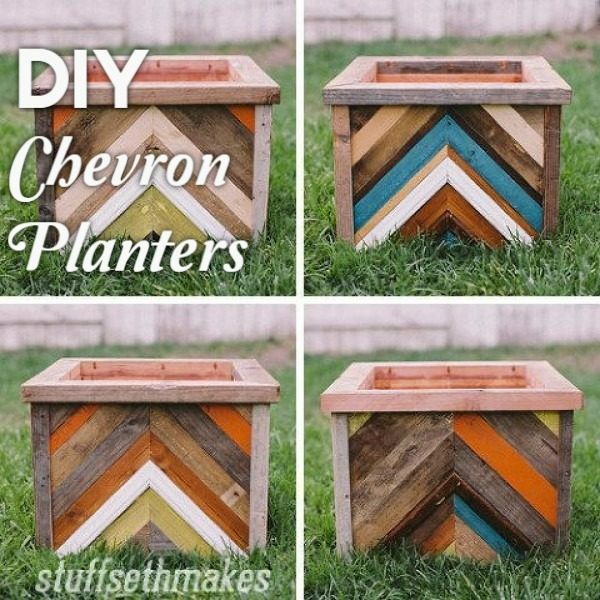 Looking to prettify your outdoors or indoors with new DIY planters? 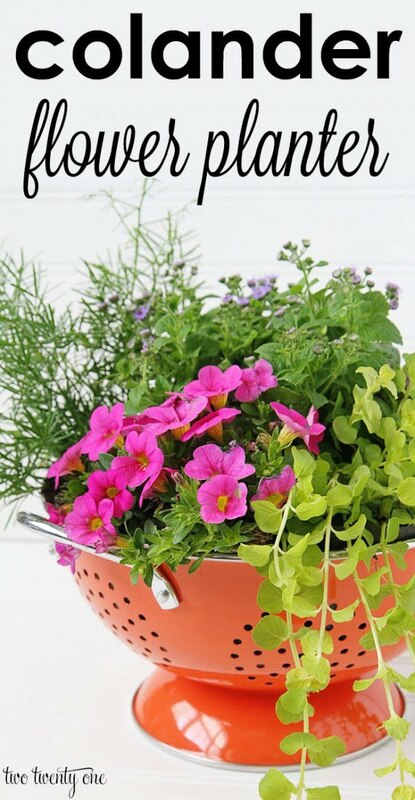 Here are 77 easy project ideas that will inspire you to make some fantastic pots. Whether you’re a seasoned gardener or just want to try your hand at this green thumb thing, you always have to start with one thing. And that’s making sure you have enough planters for your plants to grow. You can do it outdoors in your garden or backyard, and you can grow plants indoors. 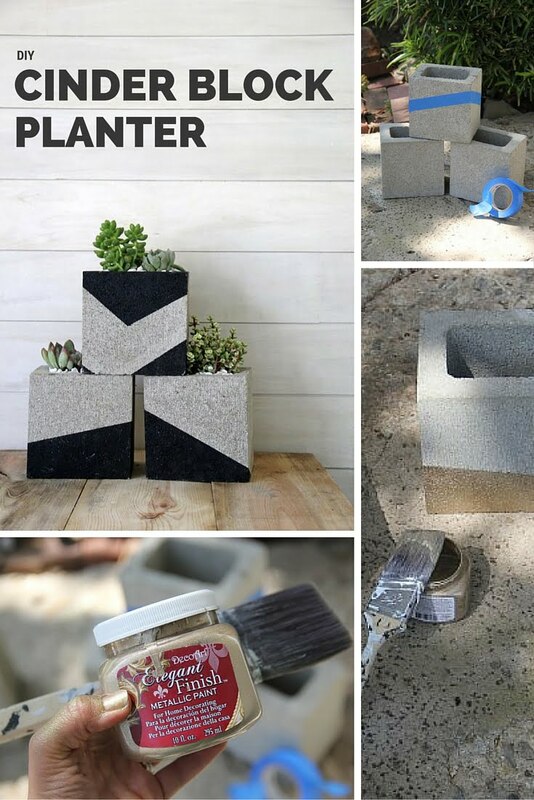 In either case, you will love these easy and cheap DIY planters of all types. All details about each step are explained in the following tutorials. Choose the one you need from the list below. Bringing in new greenery inside is a great option to let spring into your home and creative planters to keep the plants can add a lot of decor value. Even more, making your planters is a great way to update your interior quickly. Check out the most creative DIY projects that we have found for you. 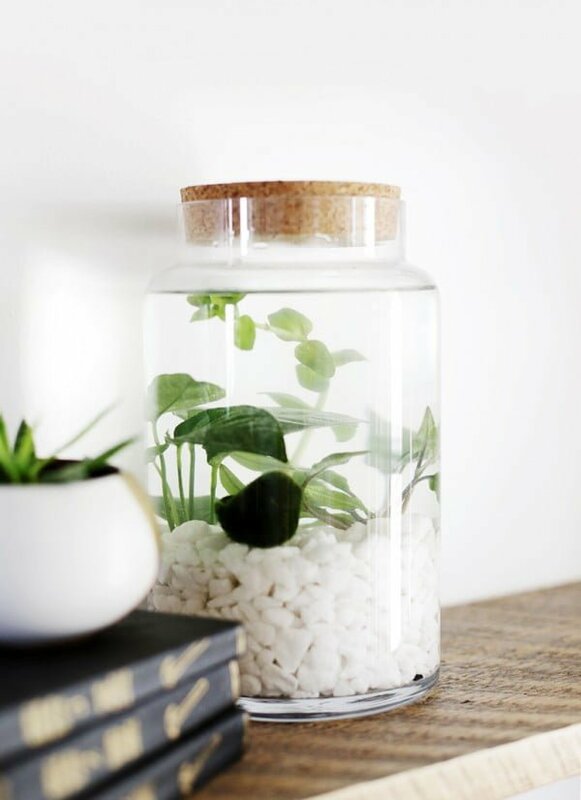 Aquatic plants are different than your regular houseplants and having a terrarium as part of your decor can make a great accent. They’re very easy to maintain, and you can keep them just about anywhere. Check out this tutorial to see how you can make one yourself. A wall planter is a creative way to turn houseplants into art. If you have empty wall space or you need to swap out old wall art, this can be a great way to be unique with your decor. 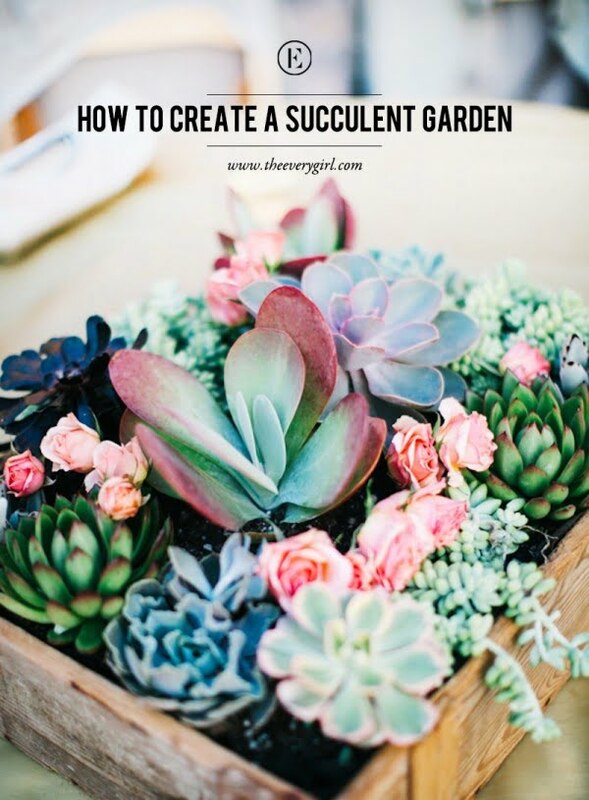 Succulents are perfect for this because they are so easy to maintain. 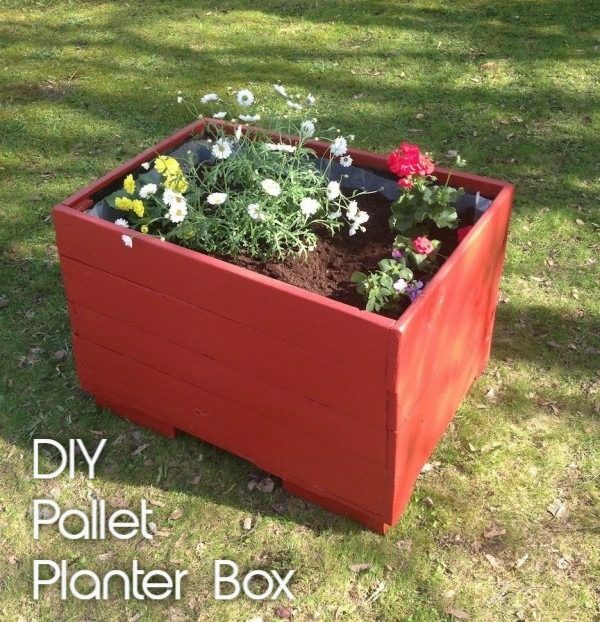 Follow the tutorial to build the planter at home. Succulents are great houseplants in that they are easy to maintain and they can add color as well as greenery to your home decor. Creating your indoor succulent garden is easy as well. Check out the tutorial to see how to do it. 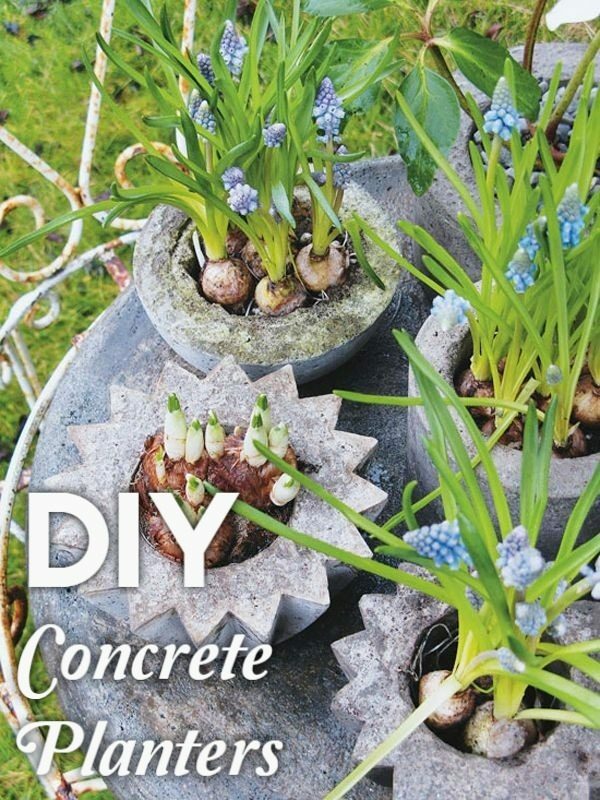 Concrete has lots of charm in home decor as an industrial style accent so making planter pots out of it lets you use it to your advantage. Making them is a lot easier than you think. Check out this tutorial that will show you how. Experimenting with a gold leaf can take you a long way, especially if you want to add some glamour to your decor the easy way. This vase can be used as a planter just as well. Check out the tutorial on how to make one. If you like original and whimsical decor accents, you’ll love this DIY project. Use an old book to create a remarkable planter that will be a talking piece without fail. The easy tutorial will show you how to do it. This planter is fantastic for two reasons – first, it’s made of a material that you can find for free and secondly, it is lovely. 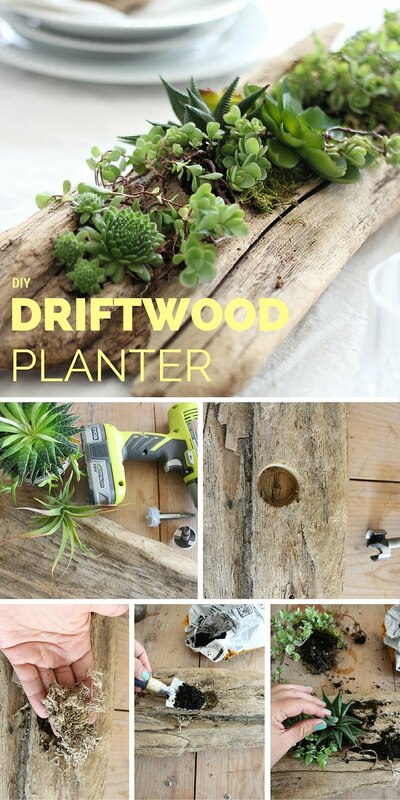 A driftwood planter can be used outside in a garden or patio, or inside to bring natural accents to your home. 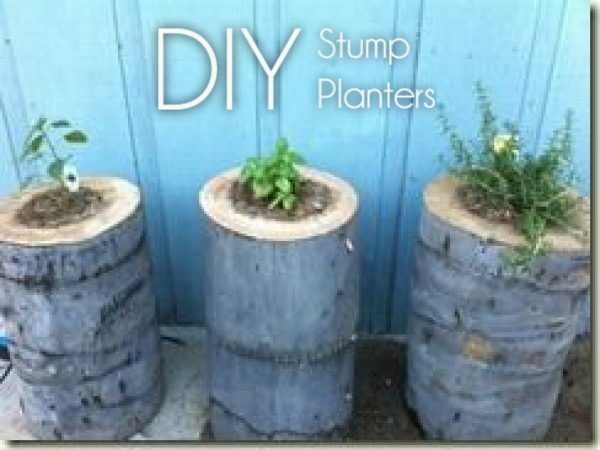 Perhaps the most common and easiest to make planters and the plant and flower pots. They are great to use both, inside and outside. And you can embellish them in so many ways for decor value. Check out these ideas. A great way to improve your houseplant pots by enhancing your home decor is to paint them. And while you may not have the hand of an artist for that, it’s easy to paint attractive but straightforward shapes. The tutorial will show you how to do it. We love the rustic decor, and there’s no reason why planter pots cannot be in this style. It’s a straightforward project to turn simple terracotta pots into stylish decor accents. Check out the tutorial to see the instructions. Marble may or may not be your favorite material as far as adding some interest to your decor goes but these planter pots do look good. 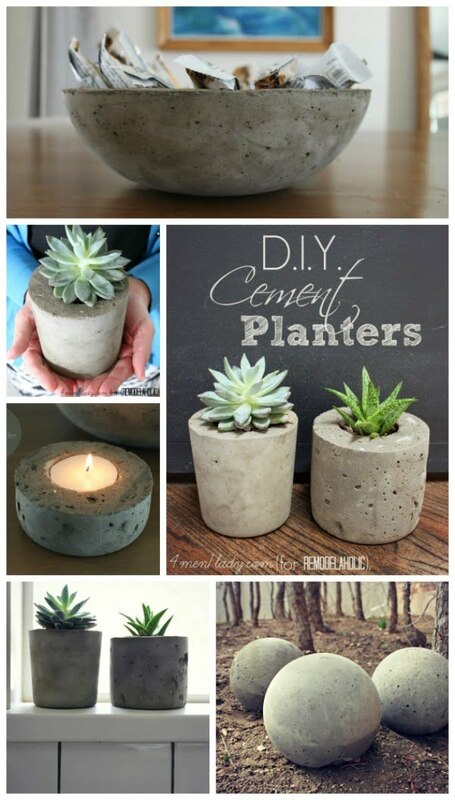 If you like the look, you can save some money by making faux marble pots instead of buying the real thing. This tutorial will show you how to do it. 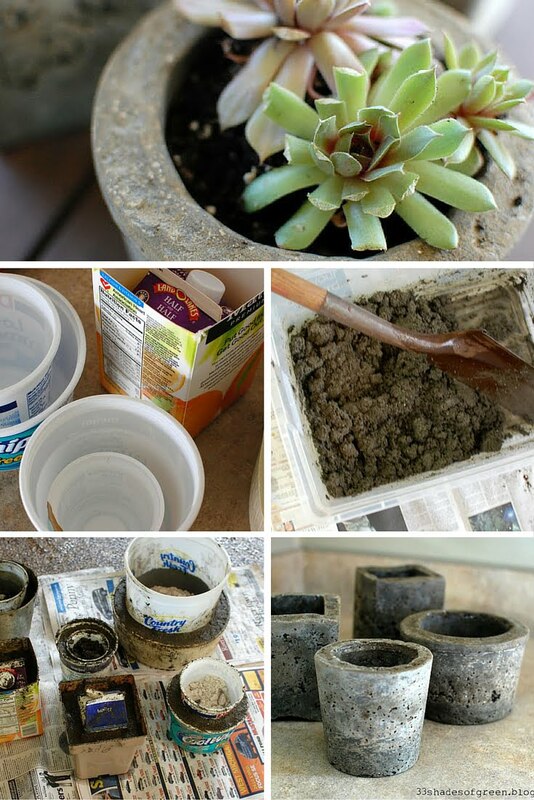 Here’s another little DIY project for your regular terracotta pots that will make them stand out. Use chalk paint to achieve this look and add lovely rustic accents to your decor. Follow the instructions in the tutorial. 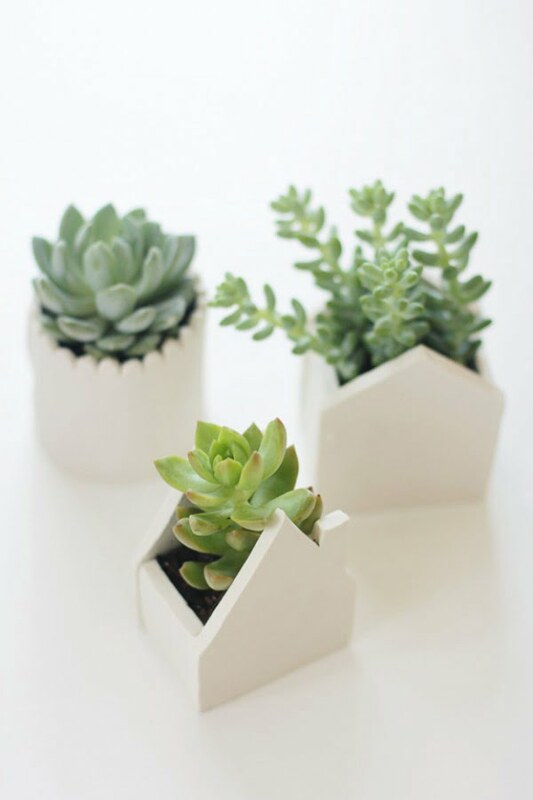 Aren’t these little succulent planters just lovely? And the best part is that you can easily make them at home. Take on this adorable DIY project by following the tutorial which will guide you through the process. Mini succulents are great in that you can sprinkle them all around your house for small but meaningful accents. 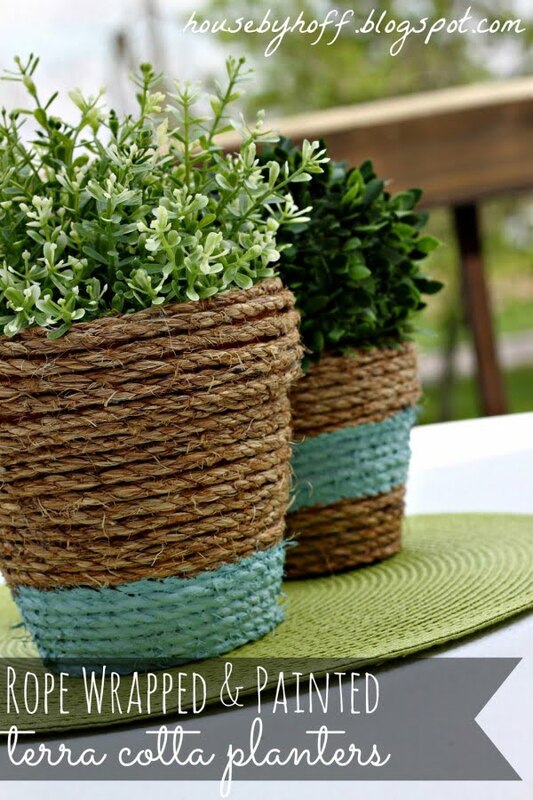 Make these mini pots to take it up a notch and add some pops of color in your decor. Use the tutorial to help you. One more way to style you terracotta planter pots and turn them from boring to fab. Use some rope and paint to wrap them and give them a lovely rustic style. The tutorial will show you how to do it correctly. 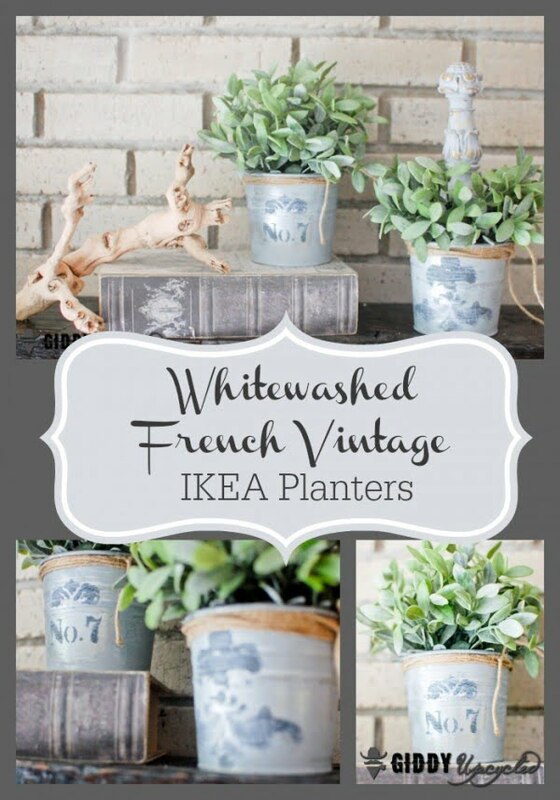 If you’re one for shabby chic or French vintage style, these whitewashed planters will make your day. 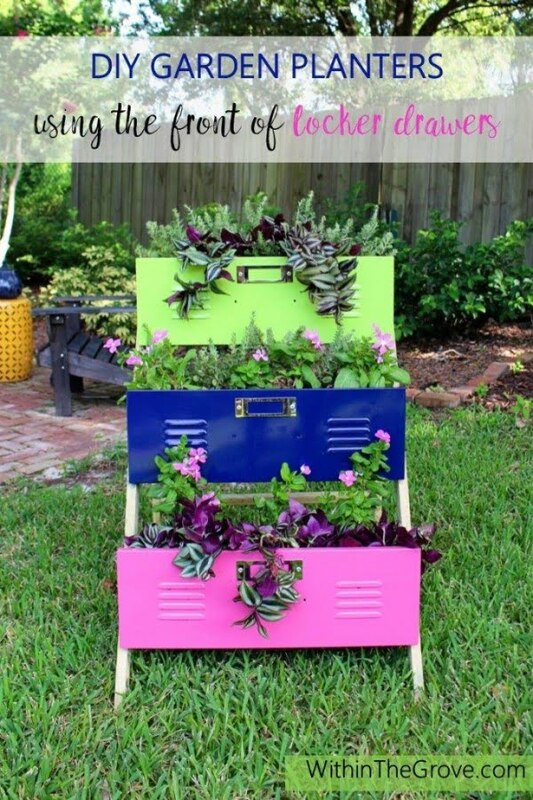 Take some standard Ikea planter pots and turn them into something fabulous. Use the process shown in the tutorial. A chalkboard planter is a swift way to add decor interest to a simple terracotta planter. All you have to do is use the chalkboard paint to paint it and write your creative messages with chalk on your new pot. It’s simple and straightforward – worth a try. Follow the tutorial for easy instructions. If you are a fan of Anthropologie, then you already know that not only are their products quirky, but they tend to sell out fast. To recreate a textured planter that recently sold out, all you need is a planter, some odds and ins and a little time. 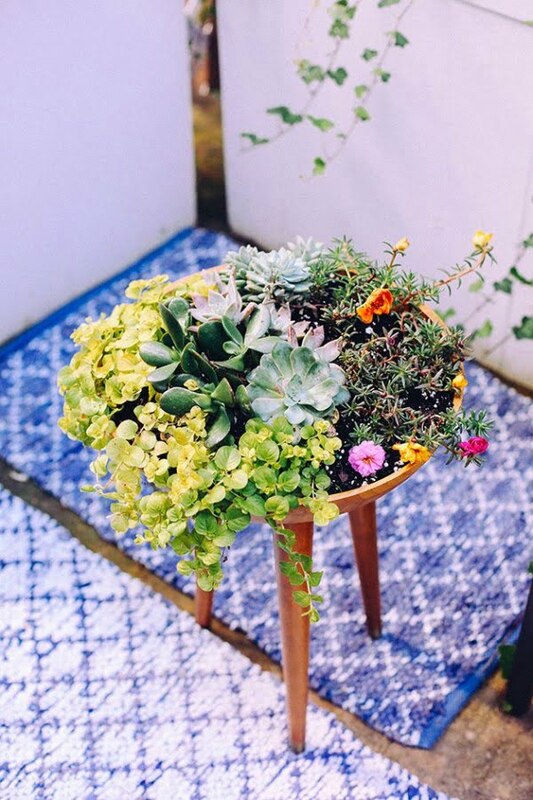 From wine corks to wooden blocks, adding outside texture to a planter can take it from traditional to modern in just a few short strokes of your glue gun. Play around with different ideas to see which one suits your personality best. We love the wine cork idea which helps you save memories while also creating style. Looking to elevate a simple clay pot? Just add a tripod set of legs to create a modern look without breaking the bank. All you will need is a little weather-proof glue, paint and a few minutes out of your day to complete this look. 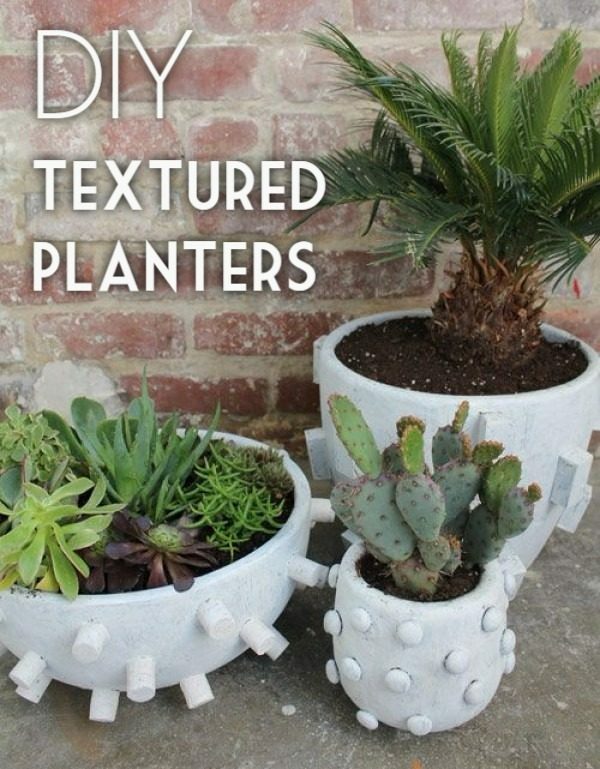 You can make DIY planters from many materials, and recycled things have their category. 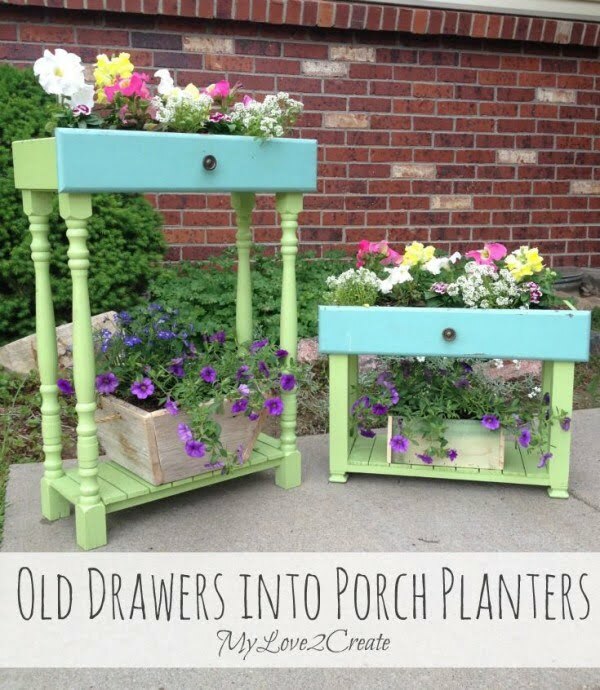 There are so many old things you can upcycle to beautiful planters that you can use outside or inside. Check out these ideas and tutorials. This DIY project will take an old baking tin so if you’ve got one you’re in luck. The planter honestly looks unique, and it can be hung on a wall for easy access to herbs or to adorn your walls. You can easily add a whimsical decor accent to your home by making this cute but straightforward planter from an old teapot. It’s as simple as drilling a hole in the bottom of the pot for drainage. 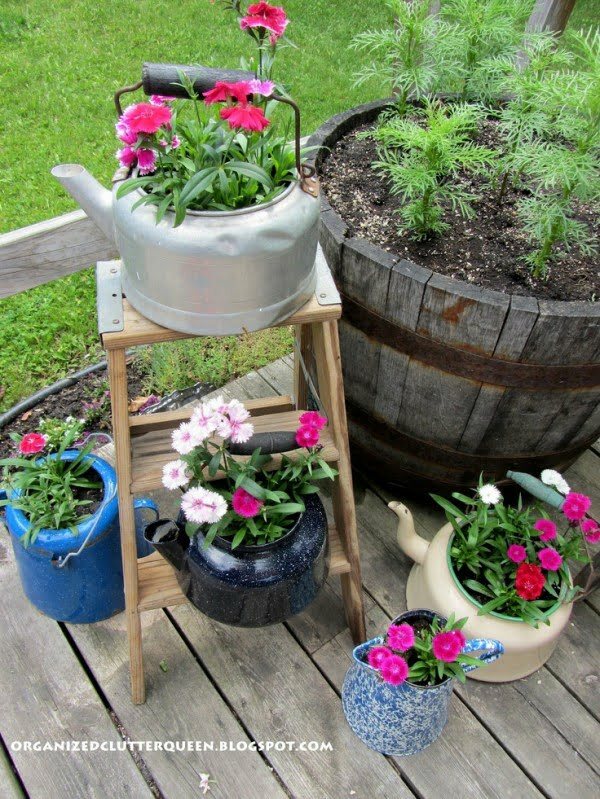 So get an old teapot from a flea market or elsewhere and make yourself this brilliant planter. The tutorial will explain you all the details. If you subscribe to Better Homes and Gardens, you have likely already run across this idea, but you may not be sure how to execute it. 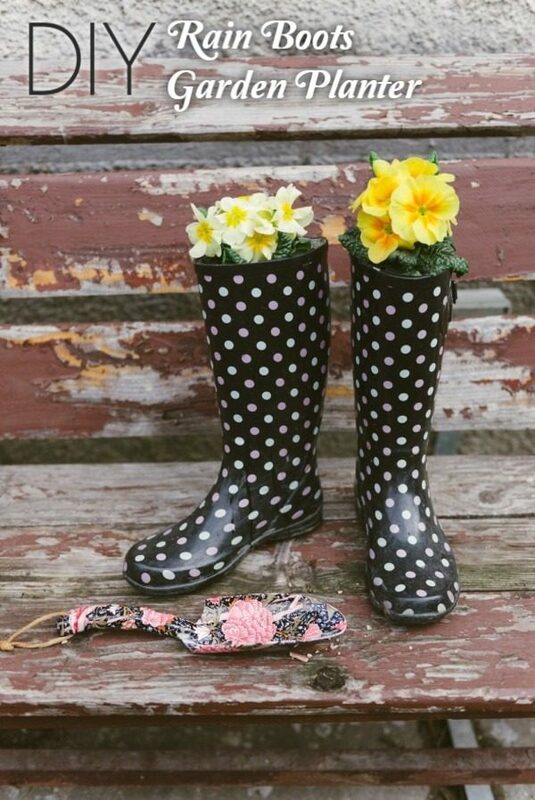 While you cannot just stick a plant inside a boot and expect it to live, if you drill a feet holes in the sole for draining, you will have a perfect place for plants to thrive… and look cute while doing it. 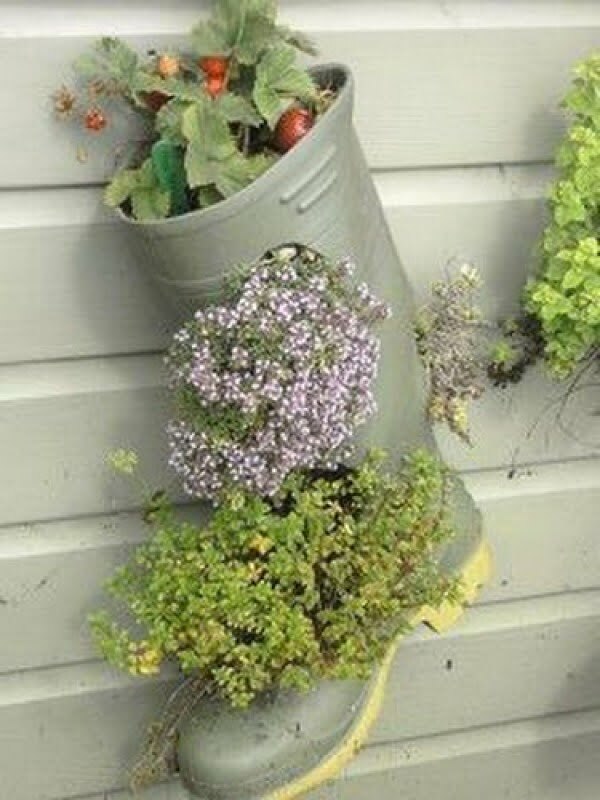 What is better than a gumboot planter? The kind that hangs on your fence and shows case carrots, herbs, and other goodies. 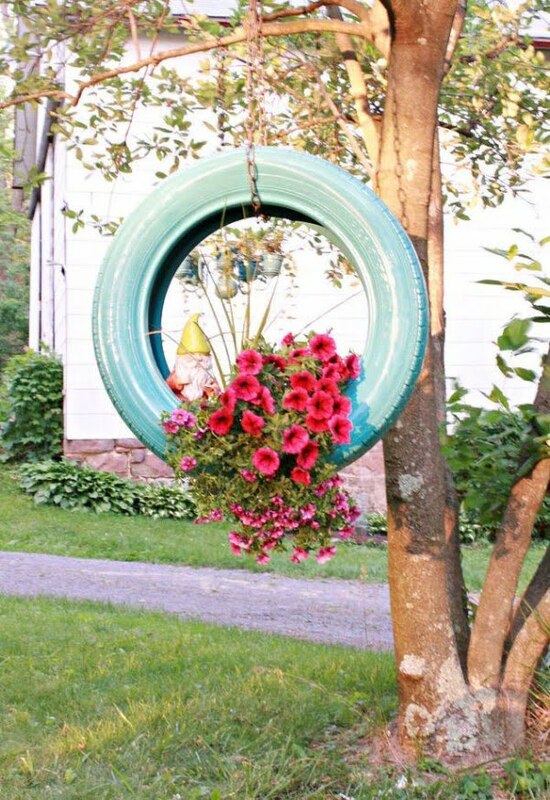 Just add a little hanging hook on each to add a homey vibe to your backyard. 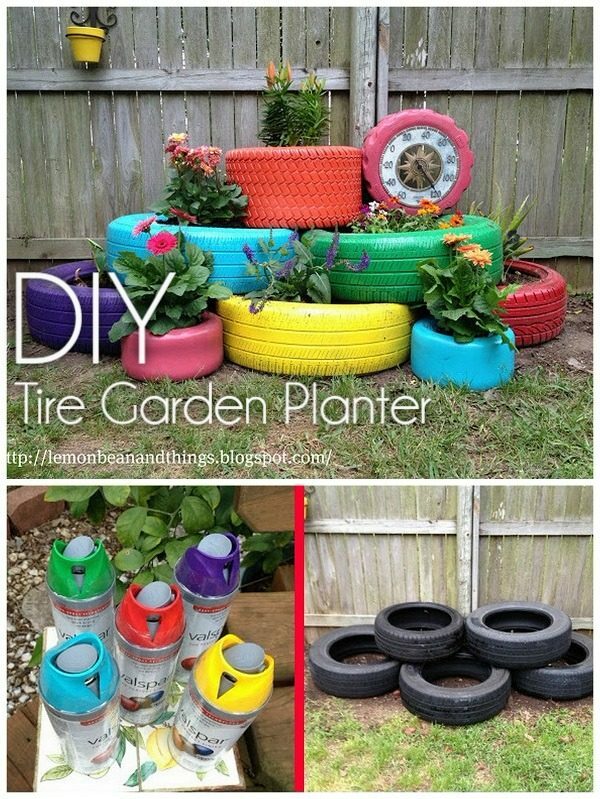 If you have any old tires laying around your place, then this project is perfect for you. 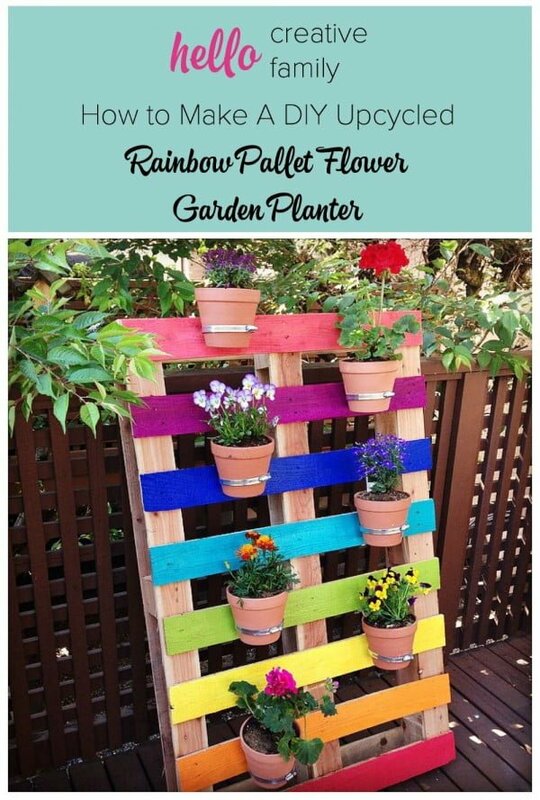 Economic and whimsical, all you need is a fresh coat of paint, some pallet boards, and a feed sack to make sure that your planter works appropriately. First, paint the tires and allow them to dry. Then use pallet boards to hold in place a feed or flour sack. This will let the water to drain through, assuring that your plants live for a long time to come. 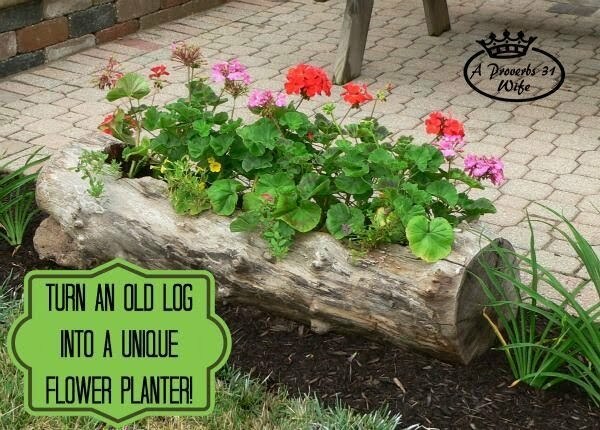 Proverbs 31 Woman recently debuted a hollowed out log planter idea that we just fell in love with. Start with a hollowed out log… and don’t be afraid to ask for help if you aren’t sure what you are doing. Three years seems to be the shelf life for this planter as the bottom can begin to rot after this amount of time. So be sure to keep a watch on the bottom of your planter to know when it is time to replace yours. Got an ugly shed wall that you need to cover? Start by using screws and bolts to secure painted tires to the side of your wall. Drill in holds to the tire’s bottom to allow the water to drain away from your plants. Next, plant a variety of beautiful wildflowers or other plant favorites to put your unique spin on an old, plain wall that needs a little extra something added to it to help it shine. Here’s another way to recycle tires, this time with a more refined look. A circular board with holes acts as the base, propped up by three wooden legs. The outside is covered in rope for an impressive transformation. 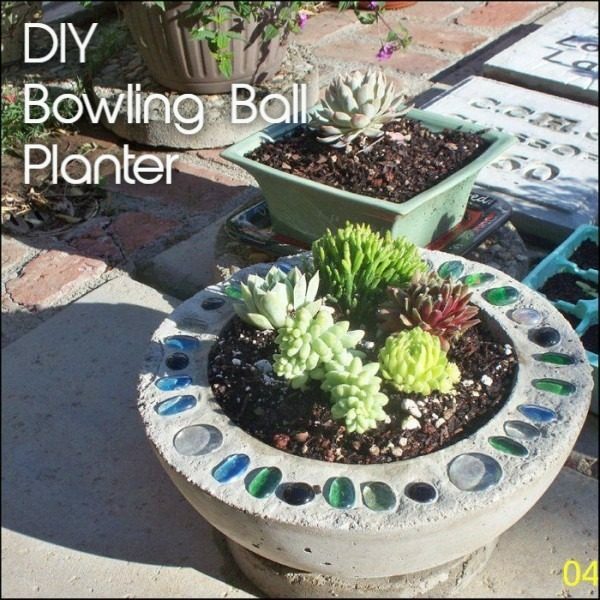 Mold the perfect semi-spherical concrete planter using a plastic bowl at the bottom and a bowling ball at the top. Decorate with stones, gems, or any other striking feature. If you cure it right, then this can last forever. Pots all seem to look the same but here’s one that boldly tries to be different. Calculated destruction turns chaos into a beautiful assembly that’s fit for a fairy. You can also make your design. 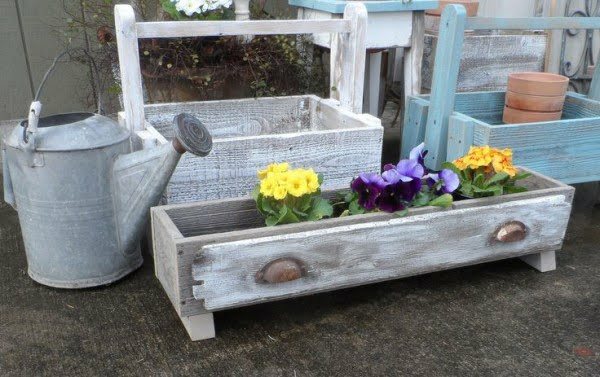 This one is a little more tricky, but with the proper equipment, this rustic take on a flower planter can add the perfect old world charm to your garden. Start by marking your barrel in thirds, then, use reclaimed wood to create a bottom and side to each tier. This will hold in different plants while still serving as one big garden display. You will want to drill in drainage holes into each level to make sure that your plant has room to breathe and to prevent root rot that can come from too much water collecting around them. 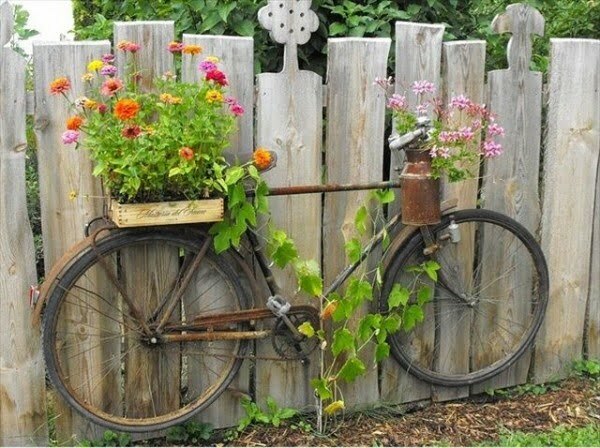 Bike lovers can use their old rides as functional décor in their garden. Baskets may be attached to the front and the rear using wires. Ribbons can be strategically placed at various points to make the bicycle more attractive. 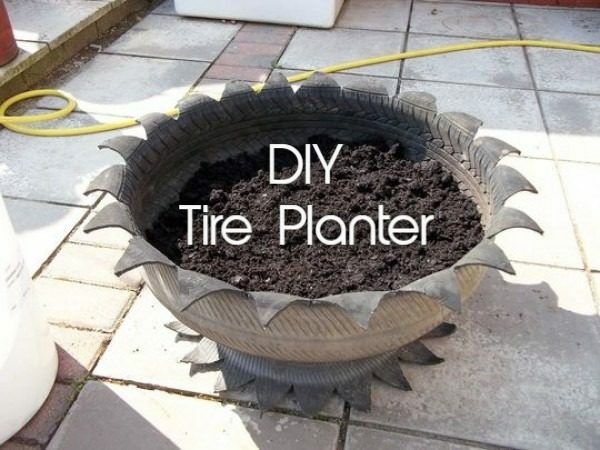 Instead of letting old tires lie unused, consider cutting them up and shaping them into pots. Having a jigsaw will make everything easier. Follow the sawtooth pattern and flip it around for a stunning centerpiece. Old furniture should never be thrown away. Turn a vintage dresser to an eclectic planter with multiple layers. It’s essential to clean it up and protect it from moisture so it can last a long time. Here’s something that is sure to catch attention. 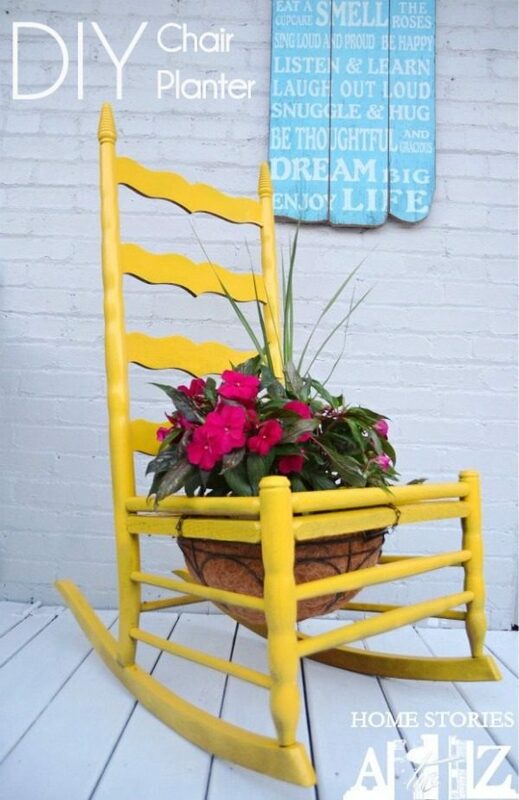 This project turned an old rocking chair into a head-turning planter fit for flowering pieces. The seat was removed to make way for a coconut liner that is secured through chains. 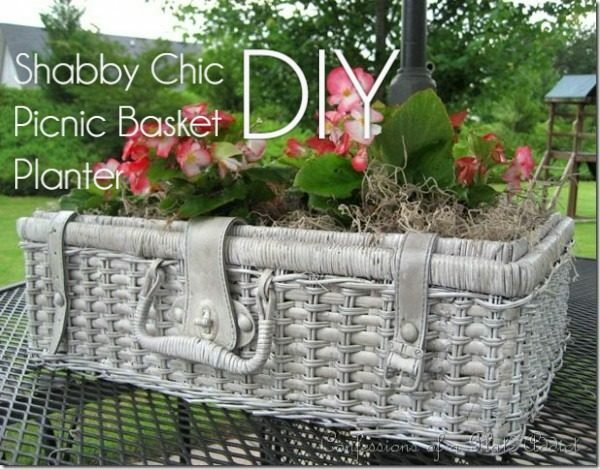 Those who are partial to the shabby chic look might want to try converting a picnic basket into a statement planter. Find a cheap one made of wicker and tweak it to your taste. Spray paint can do wonders. Plastic pots are cheap and convenient, but there are other ways to organize your plants. 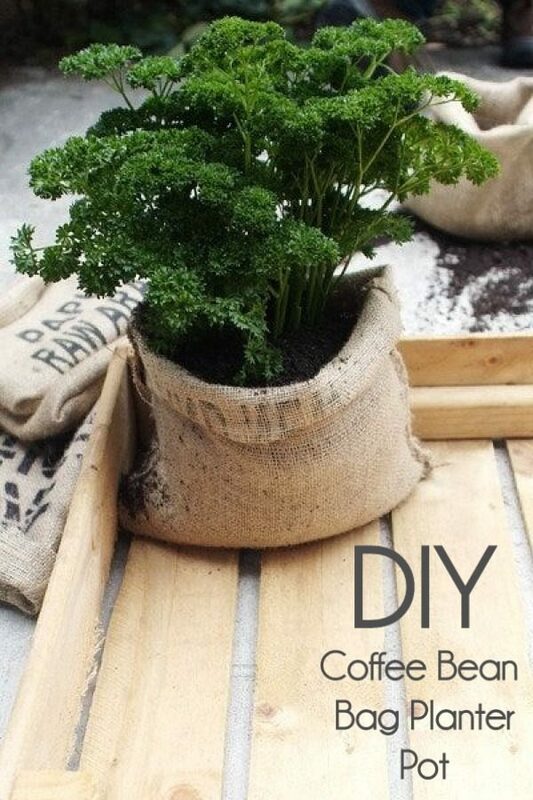 Try using discarded containers like coffee bags that have built-in holes for the soil to breathe and release excess moisture. This biodegradable, lightweight, versatile, and weather-resistant material is a perfect substitute. Planter materials can come from the most unlikely sources. For this project, they turned old office equipment into colorful containers. 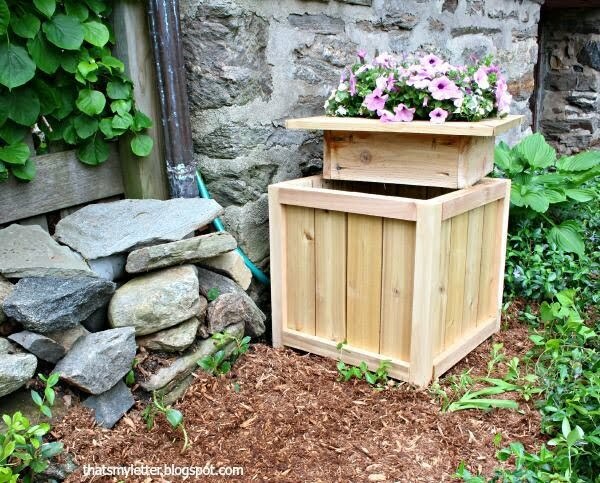 Three front locker drawers with wooden supports were stacked on top of each other to create a cheery addition to any garden. 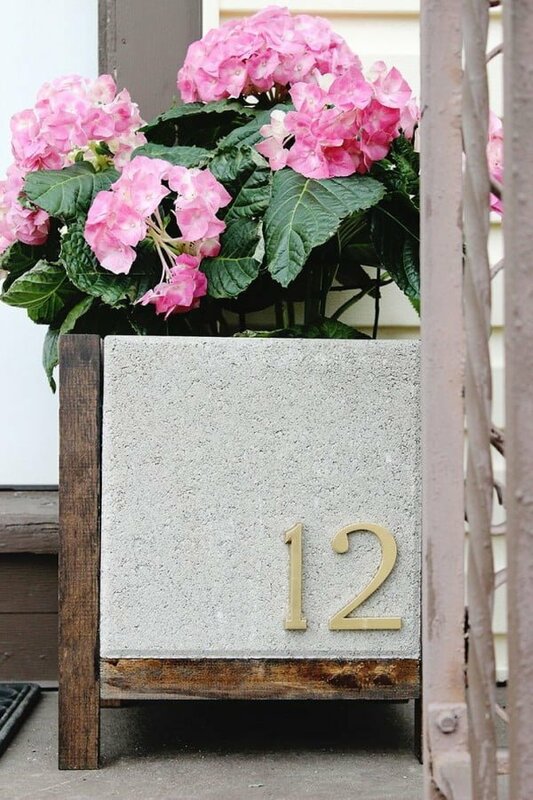 With a garbage can and some copper paint, you can repurpose a trash can into a beautiful planter. Be warned this copper garbage can weight a ton if you fill it with soil. So, instead, consider, merely placing a hanging basket in the top of the can to create the illusion of a full box without the added weight. Looking for the perfect planter for your apartment or need a housewarming gift? This planter may be just what you are looking for. 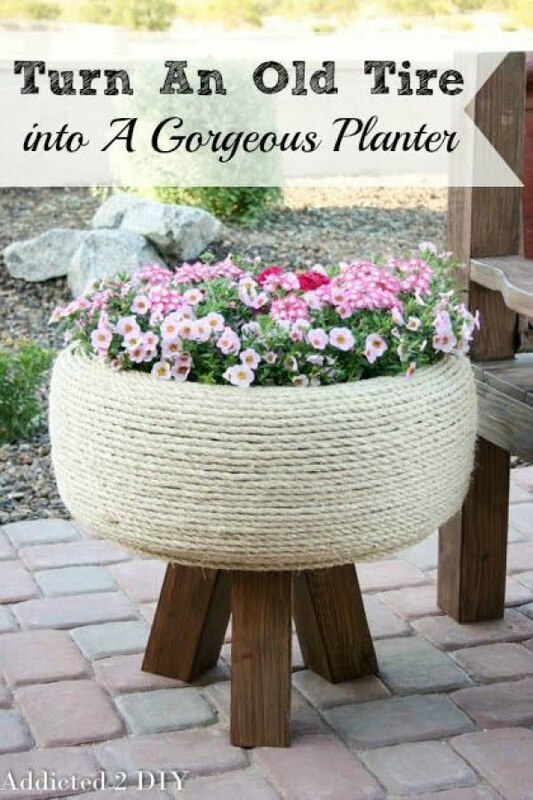 Start with a pretty colander and fill it with landscape fabric. This will prevent soil spillage. Give your plant a little water and watch as it grows for years to come. 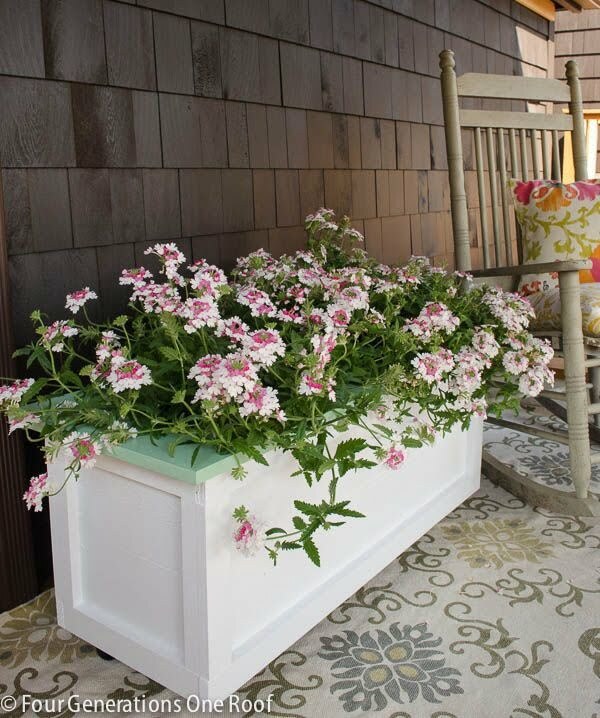 All you need to create a chic planter out of an old drawer is some store-bought table legs and paint. Just screw on four legs to a drawer, paint and drill holes into the bottom of the drawer to allow for proper drainer. Viola! A chic place to display your favorite blooms. 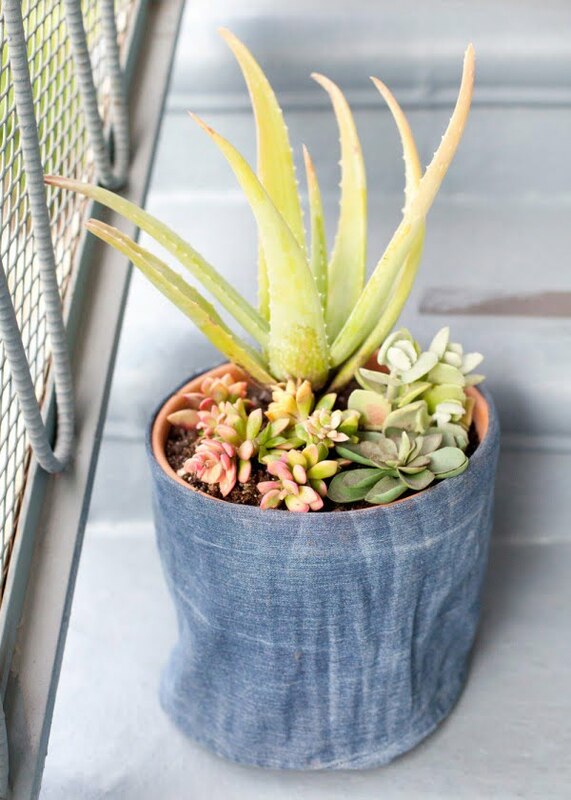 Dress your flower pots in denim by repurposing your old jeans. It’s an easy project that doesn’t even require sewing (if you use glue) and it’s a great way to get into upcycling. Check out the tutorial for a DIY project. 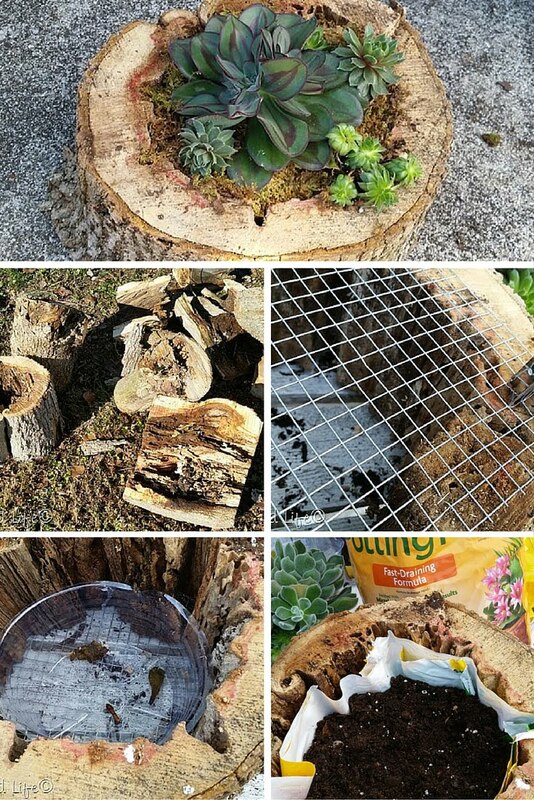 If you can get your hands on a rotted out tree trunk piece, it will make a great easy to make a DIY planter for your garden. Whether you have some of it left over or you can buy some PVC pipe for this project, it’s a reasonably easy way to build a vertical garden planter. 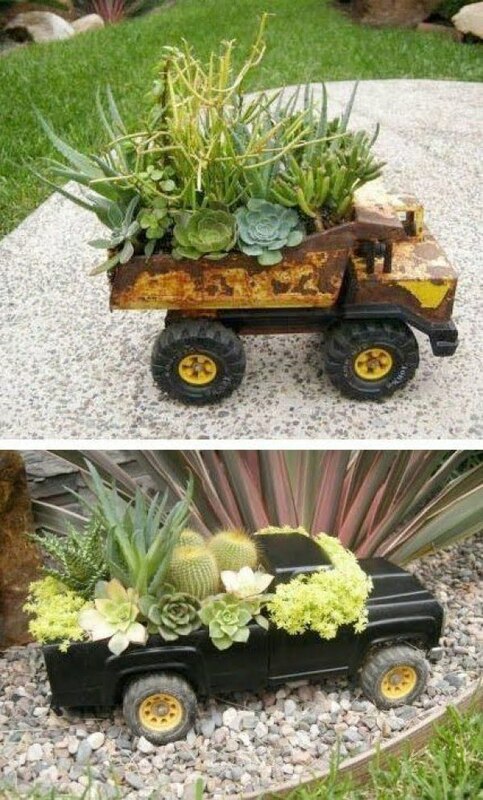 Old toy trucks make cute little planters for small plants to add around your garden as an accent piece. 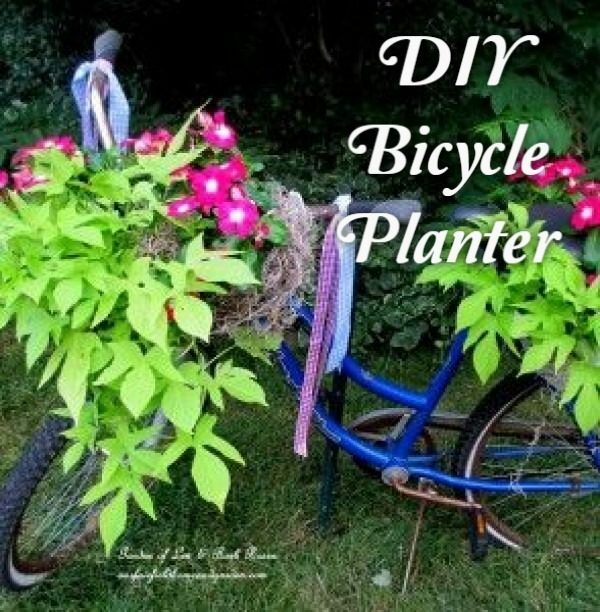 If you happen to have an old bike (or you can pick one up in a yard sale) you can use it for a planter. All you need to do is attach some boxes or cans to it. It makes a tremendous whimsical accent. 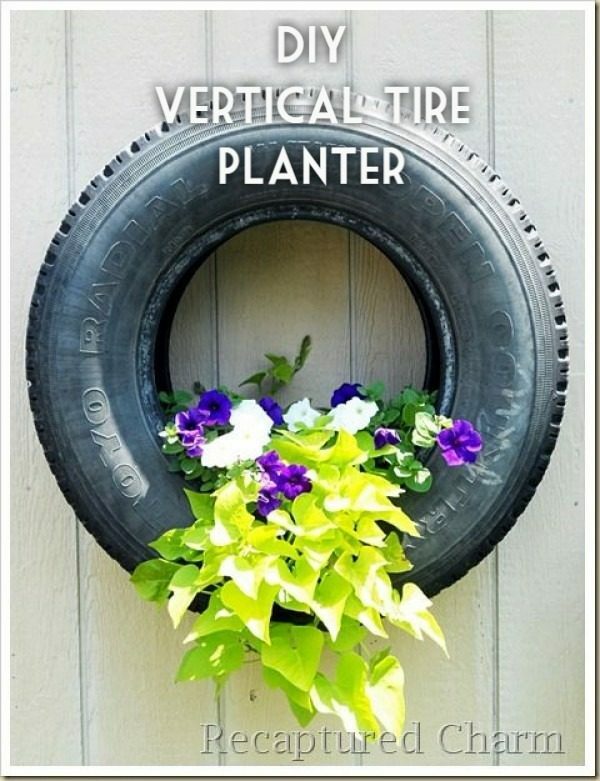 Hanging an old tire from a tree makes a great vertical planter. You can paint it any color for a better look. 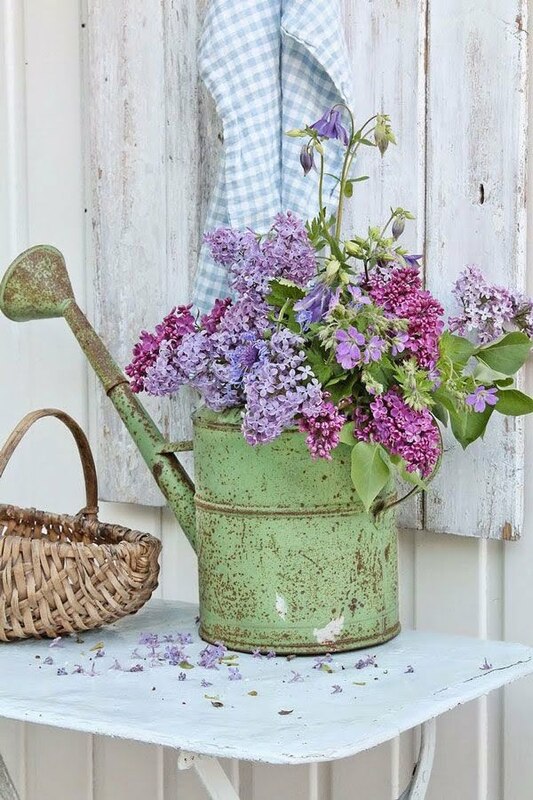 An old watering can make a cute rustic planter, all you need is to get your hands on one. All you need is an old teapot or two, whether they are metal or ceramic. 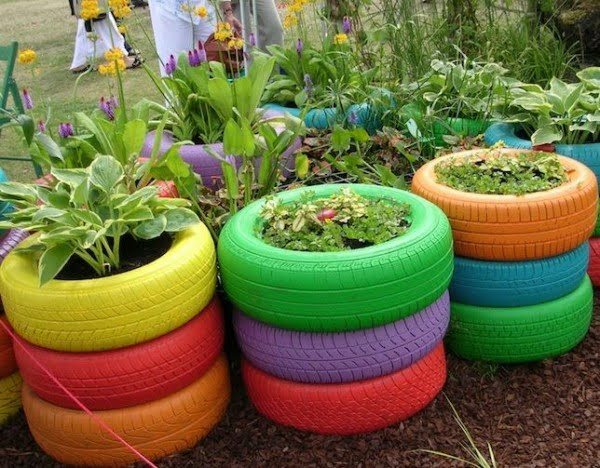 If you want to add more color to your garden, paint a few old tires and use them as planters. 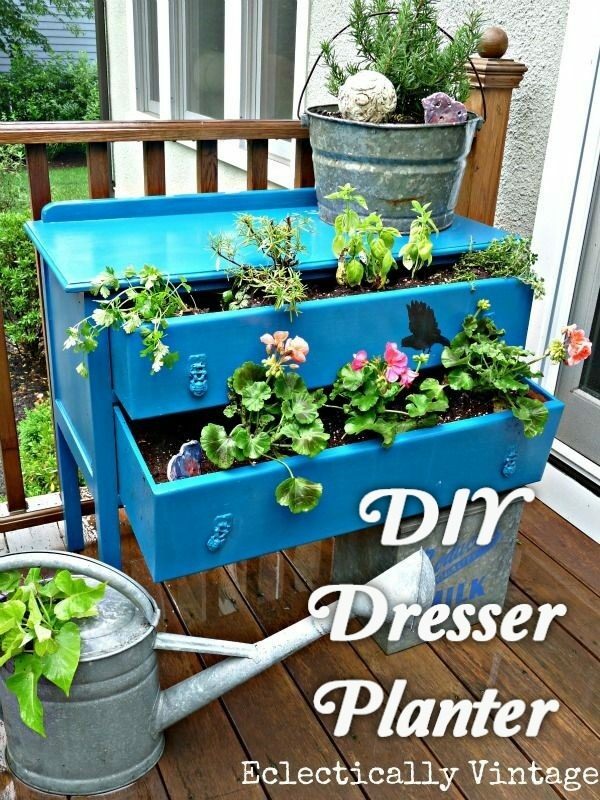 Before you throw away an old dresser, take the drawers out and use them as beautiful vintage planters. 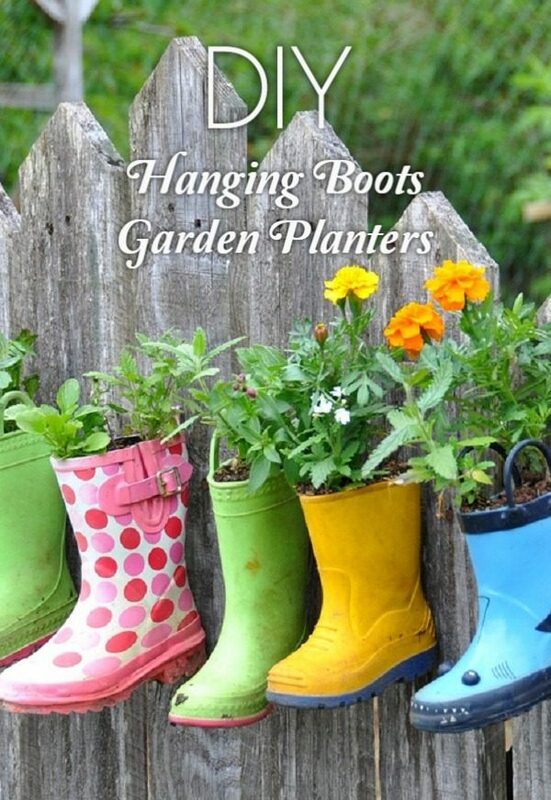 Add more whimsy with old rubber rain boots by hanging them on the wall or a fence as planters. 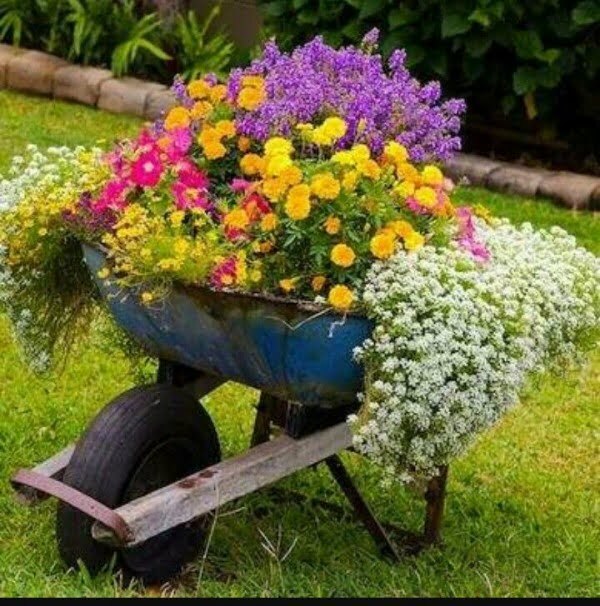 An old unused wheelbarrow will get a new life as a prominent planter. 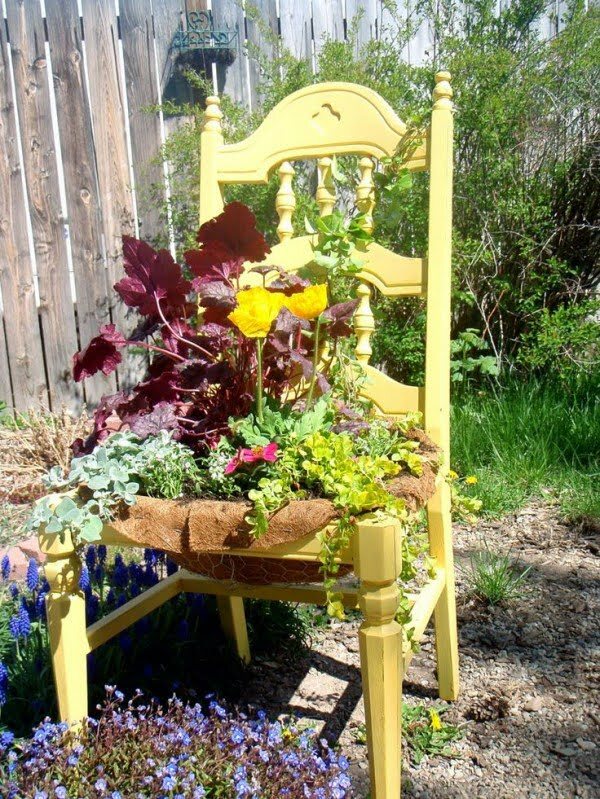 It’s more of a stand for a planter than one itself, but an old chair can add some style to your garden. 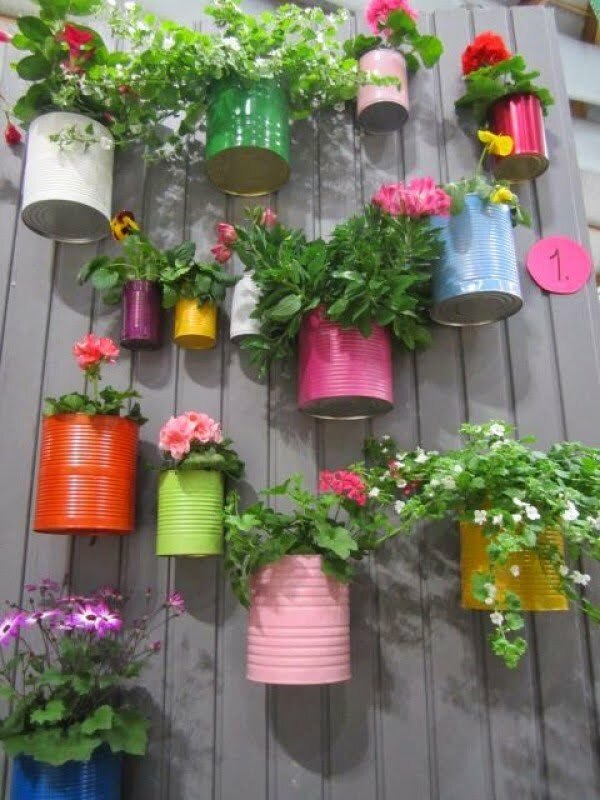 Paint some empty cans to use them as natural makeshift planters. 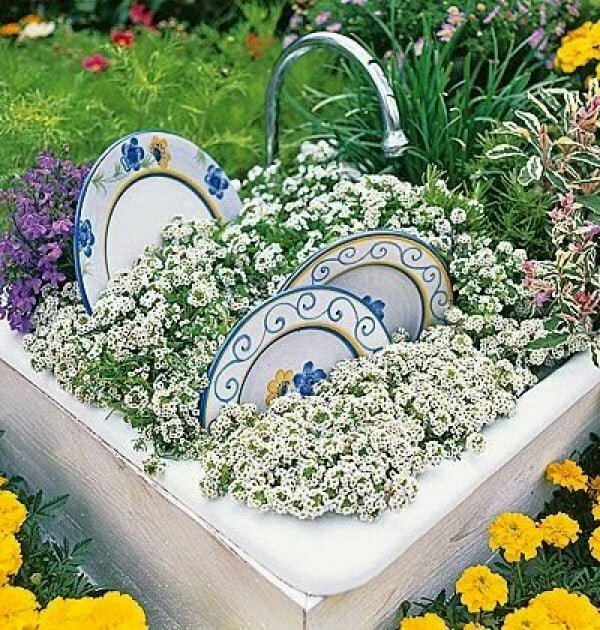 An old sink is perfect to be used as a planter not only because of its shape. The faucet and saucers add some unique whimsical accent. 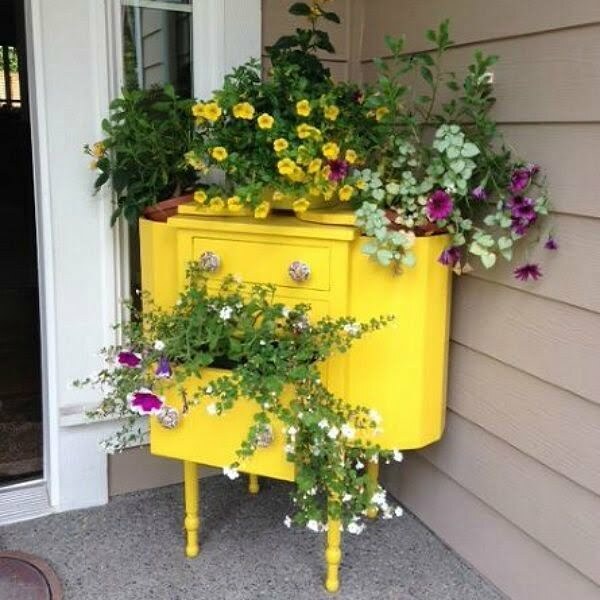 If you can’t find any use for an old piece of furniture at home, bring it outside to your garden and use it as a planter. 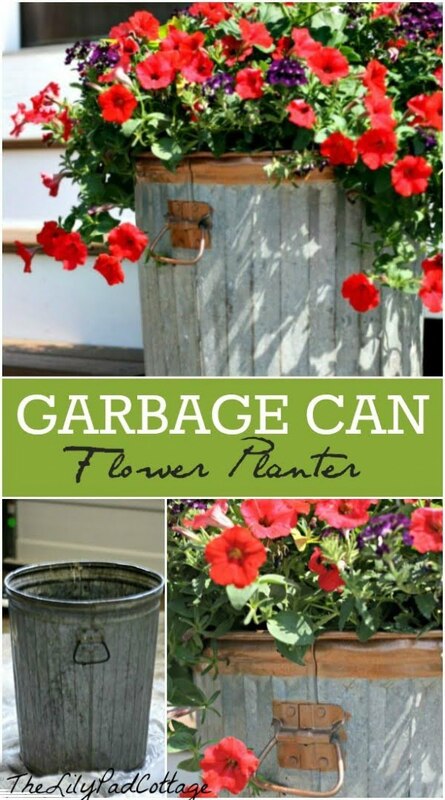 Spray paint a large garbage can, and you get a tall planter. Check out the tutorial for more tips. 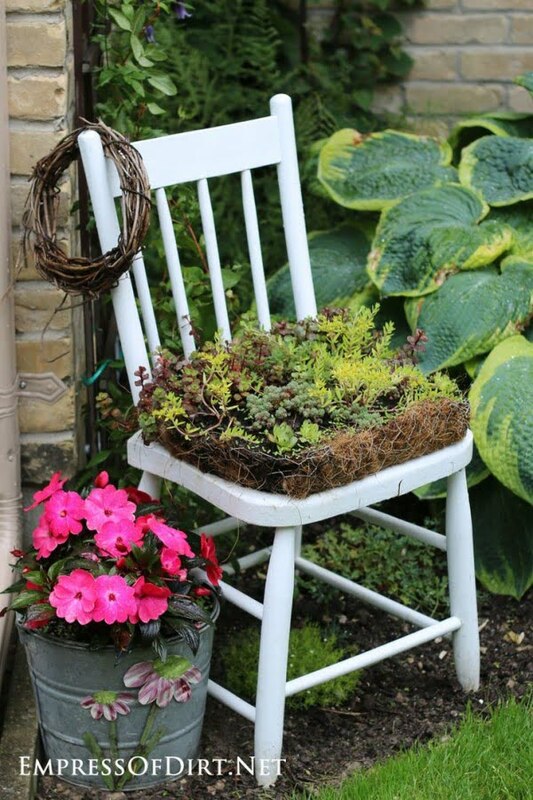 You can make this whimsical planter from an old chair. Your garden is the place to add more creative planters and sprinkle some decor accents around this way. 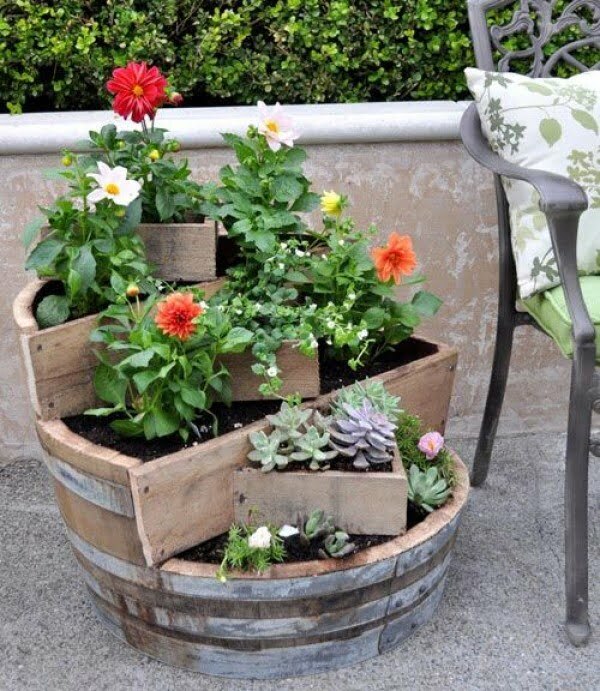 Check out these fantastic DIY outdoor planter ideas. All you need to complete this project is four concrete slabs and a caulking gun. 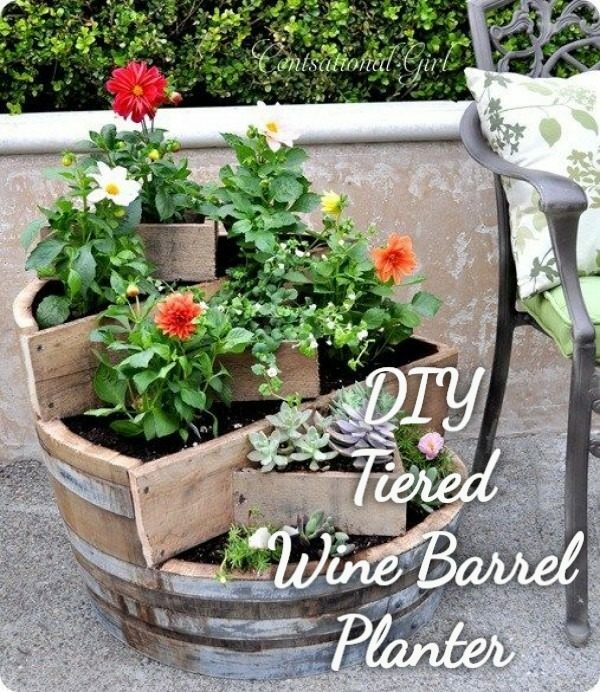 Just line up the pieces to create a planter and leave in a draining system in the bottom. You can use pallet boards to hold in a flour sack or just drill holes into whatever you have lying around the house to promote draining. This is an excellent alternative to investing large amounts of money to accommodate a modern taste that can sometimes grow expensive. For this project, all you will need is a towel, a bucket, and concrete. Start by spreading the cloth across a bucket, then pour in concrete. This creates a very unusual, floppy-like shape that will have everyone asking where you got that great planter from. For brownie points tell them you made it. To look like you know where to find unusual pieces, say that you picked it up at a local art gallery. This idea was so popular that it made its way from the wildly popular Apartment Therapy blog all the way to Good Morning America. To create one of your own, start with a wood frame and fill in the slots with diagonal painted slabs of reclaimed wood. With precise cutting and well-taken measurements, this project can be completed for next to nothing and super to boot. 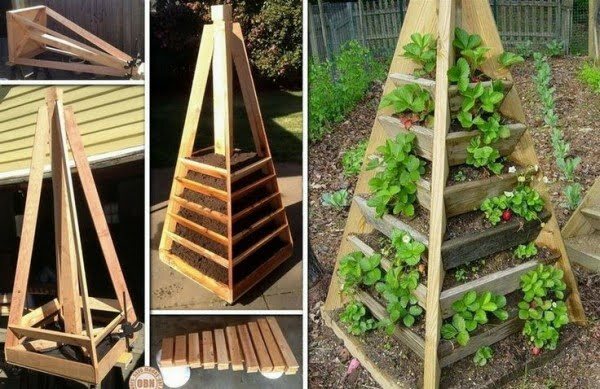 This DIY garden planter uses boards from discarded pallets. 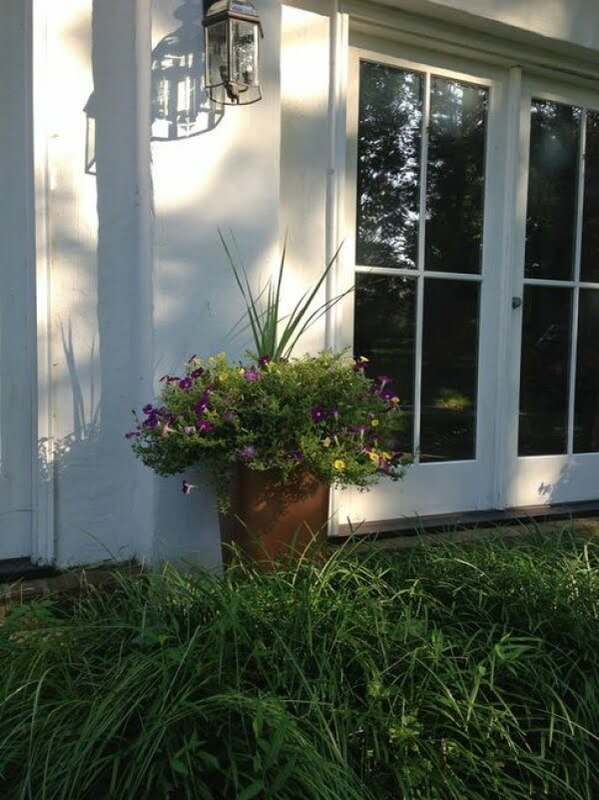 They may hold plants directly with a liner or hide containing pots in favor of a more farmhouse feel. When ground space is limited, gardeners need to think out of the box. This project makes the most of every inch by reducing the footprint and going vertical in a colorful fashion. 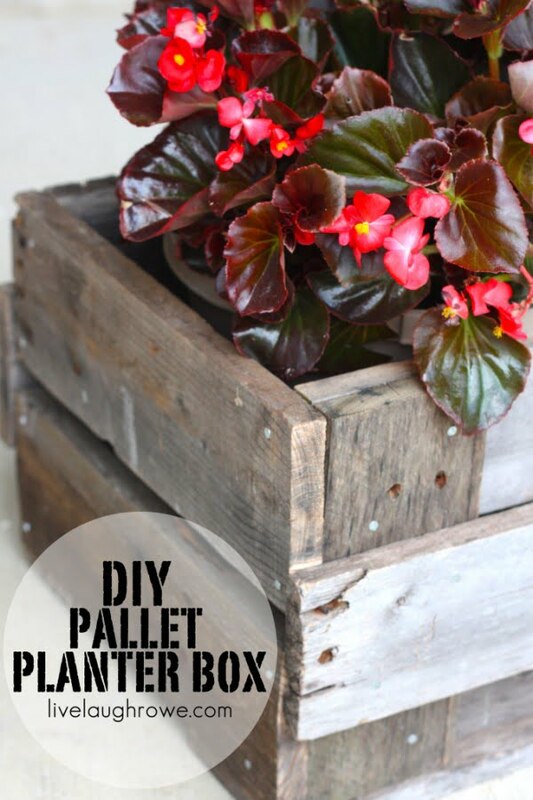 Pallets are cheap and abundant, making them ideal materials for DIY projects. This plan shows you one way of turning them into a plant holder for your backyard, along with tips for dealing with common concerns. If you like biodegradable materials, then consider using tree stumps. There might be a few lying around in your backyard. Use power tools to create a cavity in the middle. These wood planters will look great in any setting. Start by creating a simple box made out of pine. Next sand and paint your creation. Once dry, add wheels, draining holes and your favorite flower. 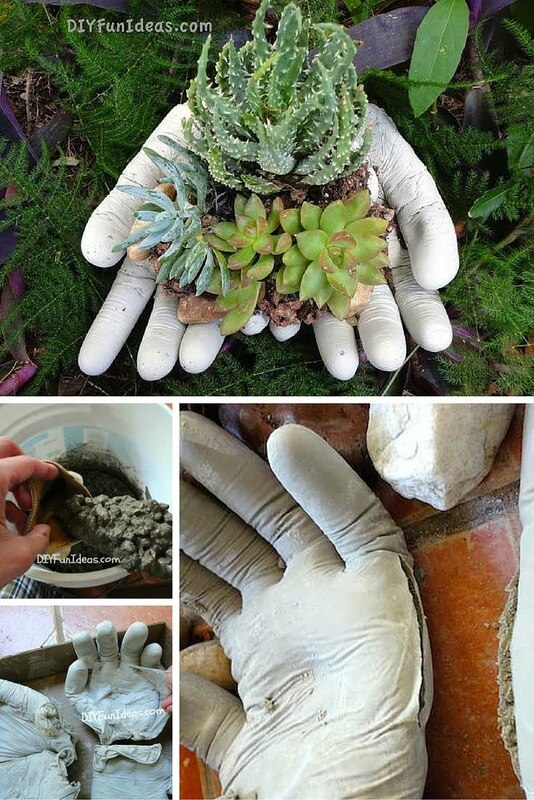 Make these small concrete succulent pots for your garden or patio. It’s an easy project and much cheaper than to buy them, not to mention it’s something you make with your own hands. 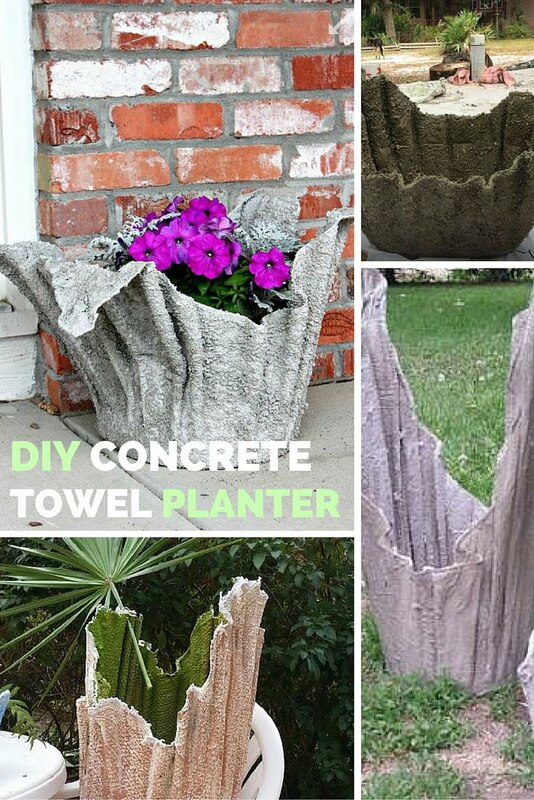 A creative project for a concrete planter made of an old towel – it makes a whimsical design for your garden. It can’t get any more simple than this. 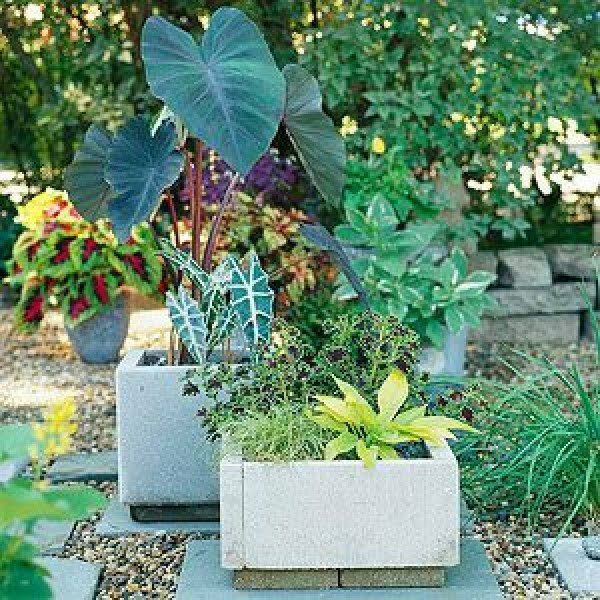 Paint cinder blocks for quick and easy but pretty planters. 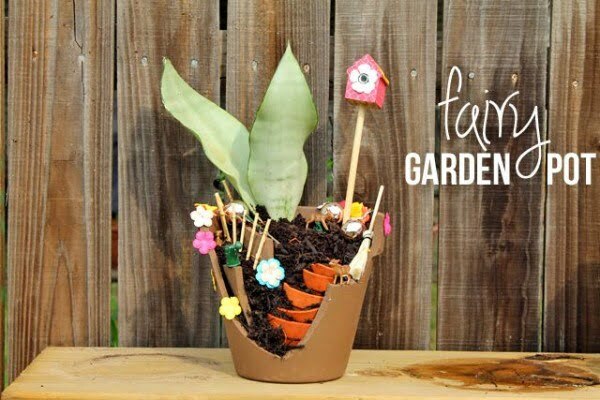 If you like whimsical accents in your garden, this awesome planter is much easier to make than you might think. 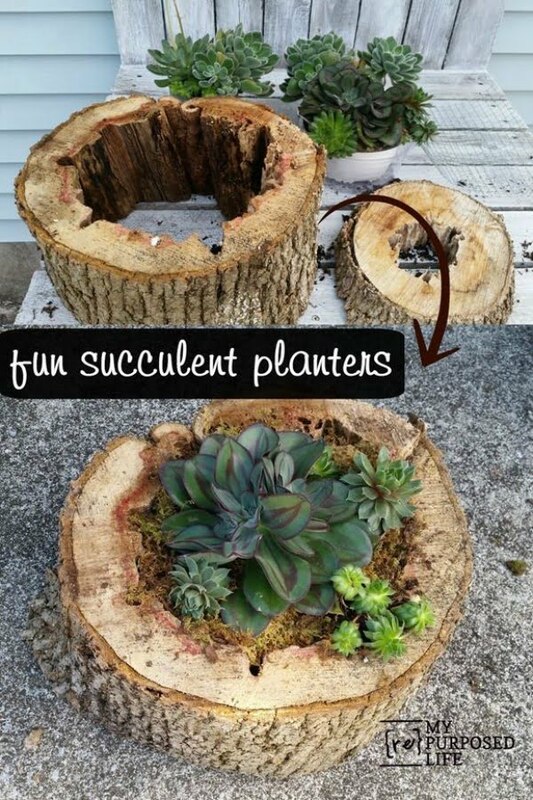 It’s a fun project to make this planter repurposing natural materials like a rotted tree trunk. They are cheap, but they certainly don’t look so. 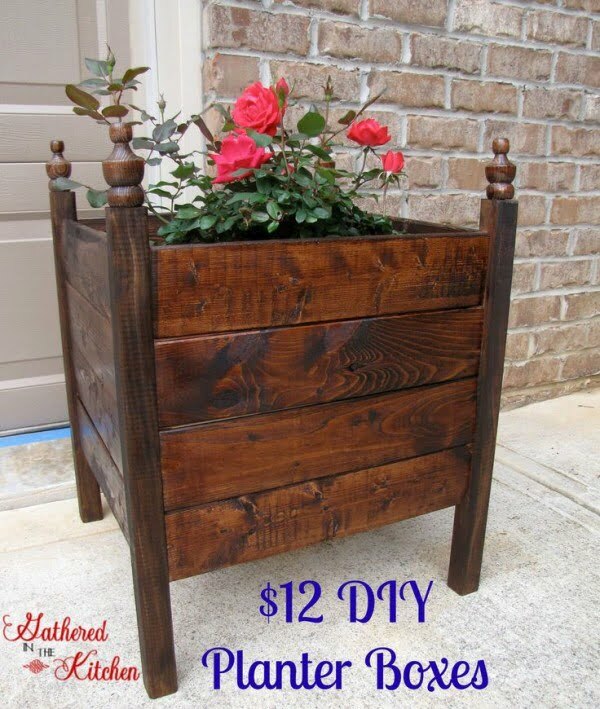 Make these beautiful planter boxes for $12 a piece. Planters can be functional, such as this hose hiding planter box. It can be used to store more than a hose too. Tiered planters are great space savers and are irreplaceable in a small garden. Build one for yourself. What do you get when you combine a few concrete pavers and wood planks? This beautiful planter for your entryway or porch. 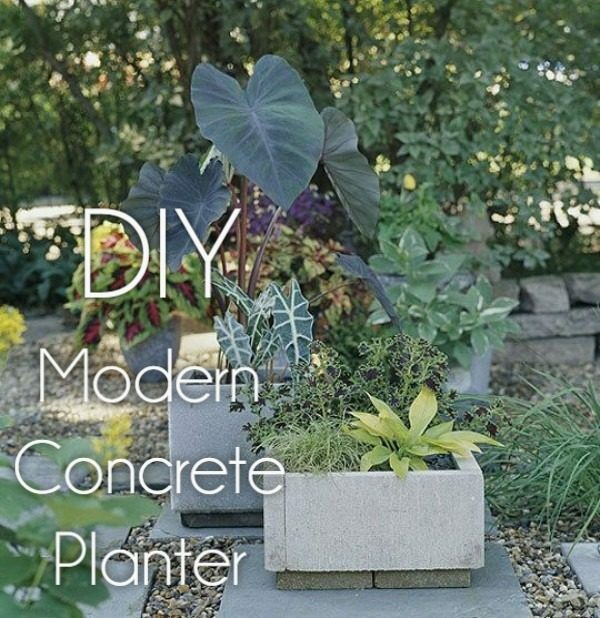 That’s right; you don’t need fancy plans to build a concrete planter – glue square pavers together with adhesive. 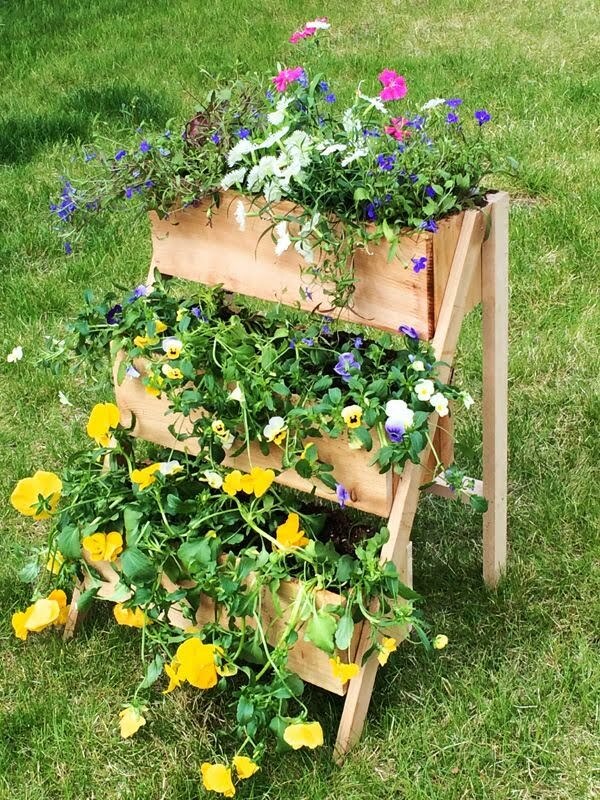 This vertical planter is great for herbs and flowers in a small garden.